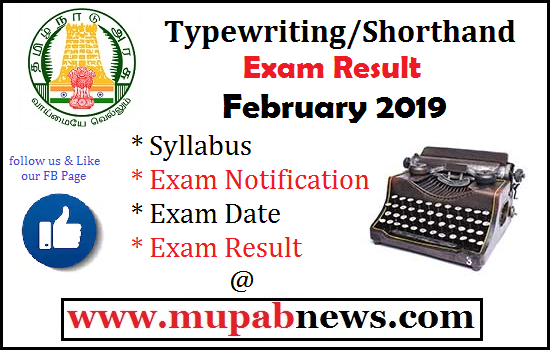 TNDTE Typewriting Exam Result february 2019 Published : In this we provide TNDTE Typewriting Results 2019 February (English/Tamil) for the Junior/Senior and Lower/Higher Level Candidates who have appeared for the Typewriting Exam in the month of February 2019 will be delcared tomorrow 20th April (Published) can check www.tndte.com type writing exam result in tamil nadu 2019 in www.mupabnews.com. Here students/candidates can download the TN GTE typewriting Results 2019 Announcement in terms of state toppers and district toppers and even though Institute wise also. Mupab will publish the results in www.tndte.gov.in typewriting results 2019 feb can be available in terms of PDF format. Subscribe our Channel for more videos like our FB page. When will Typewriting Exam Results 2019 will get published ?? To Check TNDTE Typewriting Results 2019 February Enter your Hall ticket no. in the Column Provided.Are you Searching for RRB ALP & Technician Result 2019 - Click Here. !! !Note: If Result not found on the above Link Click the below Links to View your Results as per category!!! How to download the TNDTE typewriting exam results 2019?? In that search for your Hall ticket no. Once Confirm your Typing result Visit your Respective Institute. How to apply for Revaluation typewriting results 2019?? If you are passed in Feb 2019 typing exam your are great or otherwise you failed it is not a big issue. Candidate may reapperar for the Typewriting test in the next 6 months for the Typewriting Exam February 2019. When will typewriting English/Tamil Lower/Higher certificate will issue date ?? Typewriting Exam result 2019 Feb certificate who have passed should wait for 30-45 days after the release of the tndte results 2019. Hence Candidate may get their typing Certificate from their Respective Typewriting Institute. Your typewriting master will call and inform the students to collect their certificates once the TNTCIA issued. Around Novemeber 1st week candidates can collect their certificates other wise stay tune with mupab news for further news. Source : MR. Senthil Prop. Sri Murugan Technical Institute for Typewriting & Shorthand & Accountancy Chennai.